The Newediuk Funeral Home W. C. Town Funeral Chapel in Whitby offers a full range of affordable burial services, cremation services, memorial services, planning services and bereavement services customized for any faith. We offer your family all of the modern amenities you want together with the timeless values of trust, caring service and a commitment to our community. 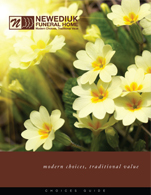 Please click on this link to view our Funeral Planning Services Guide Video or download the brochure of our Funeral Planning Services Guide. We offer a full range of affordable products for any faith. Please click on this link to view our Family Choices Video or download Our Family Choice Guide. The current funerals entrusted to our firm are listed here. If you are unable to visit the Newediuk Funeral Homes Whitby W. C. Town Funeral Chapel, you can still be with the family in thought by signing the Online Guest Book, expressing your condolences or share your most memorable recollection about the deceased. You can also place a memorial donation, send a floral tribute or be reminded of the anniversary of a death.